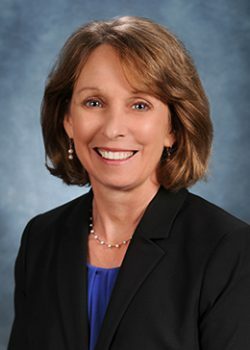 Deborah Ziring, MD, is Associate Dean of Undergraduate Medical Education/Academic Affairs at Sidney Kimmel Medical College at Thomas Jefferson University in Philadelphia, Pennsylvania. She is a general internist and lead author on “How Do Medical Schools Identify and Remediate Professionalism Lapses in Medical Students? A Study of U.S. and Canadian Medical Schools,” which won a 2015 John A. Benson Jr. Professionalism Article Prize Award. “I think for me, a lot of professionalism is about mutual respect and just holding people accountable. I’m a general internist but I really got involved in med ed as my dominant role in 2002 when I was overseeing clinical skills for second-year med students. In that role, I evaluated and provided feedback for students after watching them interact with standardized patients via a two-way camera. Over eight years or so—and 250–260 students per year later—a big part of what I assessed was how they handled the responsibility of showing up when something happens. They would have a standardized patient sitting in the exam room waiting for them and maybe they had a flat tire, or a cold or whatever, and the onus was on them to communicate any way they can (email, cell phone, etc.) that they will be late or they will need to reschedule. So often the students just wouldn’t show up if something came up. It kind of began to raise my awareness around the necessity of highlighting their responsibility to the person that was waiting, that full sense of accountability and responsibility that somebody else is expecting them to be there and if something happens, it’s their job, it’s common courtesy, to just convey that. I dealt with one student in particular who had many adverse events happen. He had a flat tire, he had somebody break into his home, he couldn’t possibly send an earlier draft of a paper that he missed a deadline for because they stole his computer, it just went on and on. So either this kid had absolutely the worst luck or he was lying. And so we began asking for things like the police report and he eventually got caught in this whole web of lies. It ultimately turned out he had a very significant drug problem, which came as no surprise. His situation raised a lot of questions for me about patterns of behavior. These kinds of students aren’t the people who just do something one time, this was a pattern of behavior, which is much more concerning because people tend to not change their pattern of behavior in practice. There’s been some work demonstrating that people who have those kind of issues in medical school go on to have a higher level of disciplinary actions by state medical boards when they’re in practice. Because of that, it’s imperative that we address it but when we began to look around and say okay, so now we know that this kid has issues, what does that mean? What do we do to fix it? How long do we do that and how long do we track them? How do we know if we made a difference and when is it egregious enough to take action? Often they’re meeting the academic requirements (as this student who had the drug issue was). It really raised my awareness and voice about saying no, this is not someone who deserves to be a physician and has a serious problem based on this pattern of behavior. When we started in 2011 looking at what people at other medical schools were doing to remediate professionalism lapses, there was no standard. Our 2015 paper looked at school policies and practices at 93 schools and how they were identifying students and remediating them. The bottom line is there were crazy amounts of variability. There were some good practices but one of the problems was reluctance to report… by both faculty and students. Many faculty don’t want to acknowledge these kinds of issues and conflicts because they’re uncomfortable to talk about. Like, is it really my job to tell the girl who’s got the short skirt on where she bends over and everything’s hanging out, that that sort of clothing is not okay? One student I remember was a professor’s child, who would come in looking like he hadn’t bathed in a week, wearing a T-shirt, jeans and a baseball cap worn backwards… I mean, if you were a patient, would you want this guy touching you? I think that there is a need for early reporting and a longitudinal view in order to establish a pattern. In our current clinical system, it is really hard to look at students’ patterns of behavior because you have teams rotating for a week or two weeks at a time and no faculty member gets sufficient contact and a longitudinal view with the students so they’re less likely to want to get involved.